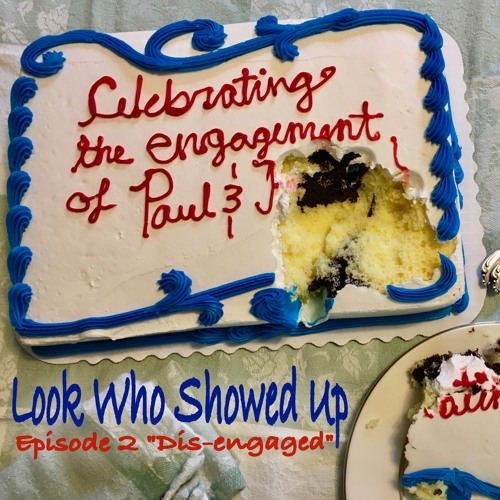 In this episode, Paul becomes disengaged moments before his engagement party. His friends alternate between cheering him up and putting him down for being such a loser. Featuring Tony Camin, Jimmy Dore, John Ennis, Dana Gould, Chris Hobbs, Jackie Kashian, Jonathan Katz, Jill Talley Kenny,Kyle Kinane, Wendy Liebman, Ron Lynch, George MacDonald, Eugene Merman, Suzy Nakamura, Martin Olson, Olivia Olson, Natalie Palamides, Ebby Parker, Eddie Pepitone, Roger Rittenhouse, Ken Rogerson, FredStoller, Mike Timpson David Waterman, Steven Wright, and Stefane Zamerano. Users who like Look Who Showed Up Episode 2 "Dis-engaged"
Users who reposted Look Who Showed Up Episode 2 "Dis-engaged"
Playlists containing Look Who Showed Up Episode 2 "Dis-engaged"
More tracks like Look Who Showed Up Episode 2 "Dis-engaged"